OLYMPIA, Washington, May 4, 2011 (ENS) – Washington Governor Chris Gregoire Friday signed legislation to phase out coal-fired energy production at the TransAlta power plant in Centralia, the only coal-fired power plant in the state. 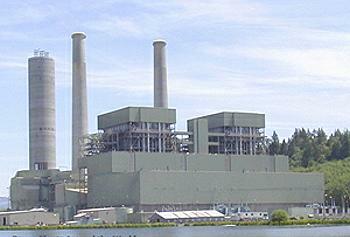 The move will end coal-fired power in Washington state in the next 14 years. More than 70 percent of the electricity consumed in Washington is generated by hydroelectric dams, with natural gas and nuclear power making up msot of the remainder. Electricity generated from non-hydro renewable sources such as biomass, wind, waste, and landfill gas accounted for a little less than two percent. Senate Bill 5769 enacts into law an agreement reached after two years of negotiations among the Sierra Club, Governor Gregoire and the Canadian company TransAlta to close the state’s only two coal boilers, the first in 2020 and the second in 2025. “The Centralia power plant has long been a critical part of the regional economy,” Gregoire said at the bill signing ceremony at the power plant, attended by TransAlta employees and executives, legislators, and members of the environmental and labor communities. In 2009, Gregoire signed an executive order directing the Department of Ecology to work with TransAlta on an agreement that would apply the state’s greenhouse gas emissions performance standards by no later than December 31, 2025. TransAlta is Canada’s largest producer of wind power, operating more than a third of Canada’s installed 3,549 MW wind capacity. Over the last two years TransAlta has constructed three new wind facilities and completed expansions of two existing facilities. “This victory is a testament to the hard work of dedicated community members and passionate volunteers who simply want to protect their neighborhoods and their family’s health from coal’s toxic pollution,” said Doug Howell, Washington representative for the Sierra Club’s Beyond Coal campaign. The Sierra Club worked with conservation, public health, faith and clean energy advocates, including the Northwest Energy Coalition, the Washington Environmental Council, Climate Solutions, the National Parks Conservation Association, Earthjustice and Earth Ministry to advocate for sensible solutions to the problems presented by TransAlta’s pollution. The coal-fired power plant endangered public health and the environment in Washington by emitting toxic pollutants such as mercury, nitrogen oxides, sulfur dioxide and particulate matter into Washington’s air and water. In 2013, TransAlta will install additional air pollution control technology to further reduce emissions of nitrogen oxides at the plant. The TransAlta plant is the state’s largest single industrial source of nitrogen oxide emissions. Nitrogen oxides are one of the causes of visibility-limiting regional haze in national parks and on federal lands. TransAlta agrees to contribute $30 million in a community investment fund to help with economic development and energy efficiency projects, as well as $25 million in an energy technology transition fund, to be spent on supporting innovative energy technologies and companies in Washington state. TransAlta will be allowed in the interim to sell coal power under long-term contracts within Washington, which will give the company the financial stability needed to transition to a cleaner source of energy. Washington now joins Oregon in approving a plan to phase out coal-fired power, setting the Pacific Northwest on a path to becoming the nation’s first coal-free region.